تقی زاده, احسان, احمدی گیوی, فرهنگ. (1397). ارزیابی محصولات بارش GPM و تصویربرداری رطوبت خاک با استفاده از داده‌های SMAP در شمال‌‌غرب ایران. مجله ژئوفیزیک ایران, 12(3), 70-86. احسان تقی زاده; فرهنگ احمدی گیوی. "ارزیابی محصولات بارش GPM و تصویربرداری رطوبت خاک با استفاده از داده‌های SMAP در شمال‌‌غرب ایران". مجله ژئوفیزیک ایران, 12, 3, 1397, 70-86. تقی زاده, احسان, احمدی گیوی, فرهنگ. (1397). 'ارزیابی محصولات بارش GPM و تصویربرداری رطوبت خاک با استفاده از داده‌های SMAP در شمال‌‌غرب ایران', مجله ژئوفیزیک ایران, 12(3), pp. 70-86. تقی زاده, احسان, احمدی گیوی, فرهنگ. ارزیابی محصولات بارش GPM و تصویربرداری رطوبت خاک با استفاده از داده‌های SMAP در شمال‌‌غرب ایران. مجله ژئوفیزیک ایران, 1397; 12(3): 70-86. ماهواره فعال/غیرفعال رطوبت خاک ((SMAP، برای نقشه‌برداری و پایش رطوبت سطحی خاک توسعه یافته است و در نقشه‌برداری طغیان رودخانه‌ها استفاده می‌شود. ازطرف‌دیگر، مأموریت اندازه‌گیری جهانی بارش (GPM)، اولین ماهواره‌ای است که هدف آن اندازه‌گیری بارش باران و برف سبک و همچنین باران‌های شدید حاره‌ای است. 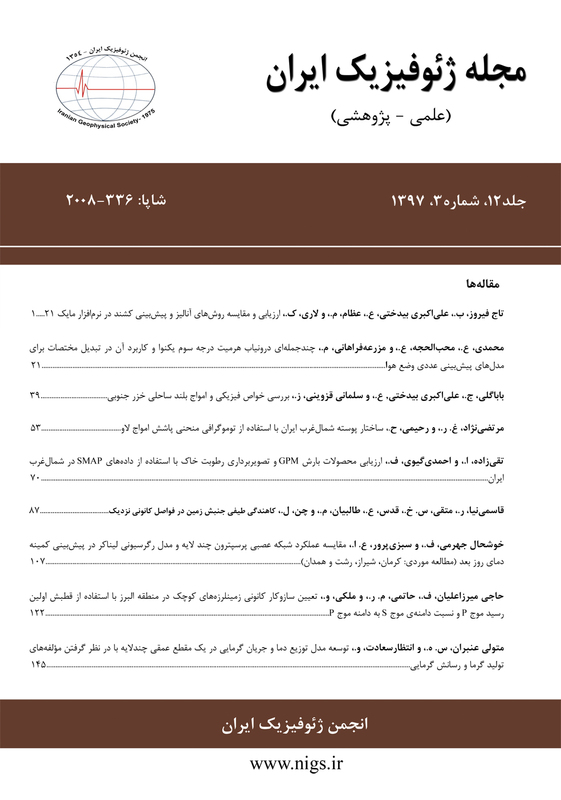 بازیابی‌های یکپارچه چند‌ماهواره‌ای برای GPM (IMERG)، برآوردهای شبه‌کره‌ای (°N60-°S60) از بارش را فراهم می‌آورد. در این مطالعه، تخمین بارش روزانه سه اجرای IMERG (نسخه 4) با داده‌های بارش 22 ایستگاه همدیدی سازمان هواشناسی کشور واقع در شمال‌غرب و غرب ایران، برای دوره آوریل 2016 تا فوریه 2017 مقایسه می‌شوند. کمیت‌های راست‌آزمایی برای دو آستانه وقوع بارش (mm/day 1/0) و نیز بارش‌های متوسط یا بیشتر (mm/day 5) محاسبه شدند. نتایج، فروتخمین این سه اجرا (محصولات) را برای بارش‌های بیشتر از mm/day 5 نشان می‌دهند، اگرچه میزان این فروتخمین برای محصول IMERG-F نسبت به دو محصول دیگر کمتر است. همچنین در آستانه دوم، احتمال آشکارسازی (POD) و امتیاز مهارتی پیرس (PSS) بیانگر کارایی بهتر محصول IMERG-F نسبت به دو محصول دیگر است. کمیت‌های نسبت هشدارهای نادرست (FAR) و احتمال آشکارسازی نادرست (POFD) برای هر سه محصول تقریباً یکسان است. به‌علاوه، در این تحقیق با استفاده از این دو سامانه ماهواره‌ای، نقشه‌برداری ماهواره‌ای سیل شدید در شمال‌غرب ایران در 14 آوریل 2017 (25 فروردین 1396) انجام شده است. مطابقت تغییرات محصول رطوبت خاک حاصل از SMAP با سامانه بارشی آشکارسازی شده توسط GPM، دلالت بر امکان استفاده عملیاتی ترکیبی این دو مأموریت برای ارزیابی و پایش سیل دارد. Soil moisture influences the partitioning of rainfall into evapotranspiration, infiltration and runoff, hence it is an important factor for determining the magnitude of flood events. The Soil Moisture Active and Passive (SMAP) mission is a microwave all-weather sensor with cloud penetration capability it can be harnessed for inundation mapping. On the other hand, Global Precipitation Measurement (GPM) is the first satellite that has been designed to measure light rain and snowfall, in addition to heavy tropical rainfall. The Integrated Multi-satellitE Retrievals for GPM (IMERG) products, with 0.1° × 0.1° spatial resolution and 30 min temporal resolution, are available in the form of near-real-time data, i.e., IMERG Early and Late, and in the form of post-real-time research data, i.e., IMERG Final, after monthly rain gauge analysis is received and taken into account. In this study, daily rainfall estimates from IMERG Early, Late, and Final runs (IMERG-E, IMERG-L and IMERG-F) are compared with daily precipitation measured by 22 synoptic rain-gauges over the northwest and western regions of Iran. Assessment is implemented for a period from April 2016 to February 2017. The assessment technique is using a contingency table that reflects the frequency of “Yes” and “No” of the satellite estimation. We have used two threshold values of 0.1 mm/day to define rain/no rain and 5.0 mm/day as moderate or higher rainfall events. The scatter plots of daily precipitation values, IMERG-E, IMERG-L and IMERG-F data against rain-gauge observations, indicate underestimation according to Bias for moderate or higher rainfall; this is more so when the precipitation threshold is increased. However, the IMERG-F shows better performance (i.e., closer to one-to-one line) in estimating moderate or higher rain. For the first threshold, all the three runs show approximately same performances; but some differences are seen at the second threshold. At this threshold, POD for IMERG-F is about 0.27 and for the two other products is about 0.14, which means larger fraction of the observed “Yes” events was correctly estimated by IMERG-F than IMERG-E and IMERG-L.
At the second part of this work, the synergistic use of satellite-based precipitation and soil moisture observations was dedicated to mapping of flood monitoring in the northwest of Iran on 14 April 2017. In this study, a value-added product was used that over-samples the SMAP volumetric soil moisture data with a spatial resolution of 40 km and posts it on a 9 km grid, SPL2SMP_E. The SMAP data maps show a pattern that is consistent with the precipitation maps; i.e., following the rainfall on 14 April, there is an increase in the saturated area and after that it begins to decay. So together, SMAP and GPM can provide information on the surface water fluxes, an important quantity for assessing and monitoring the Earth’s fresh water resources. Therefore, integrated GPM and SMAP data can serve as a key tool for application users and emergency management to assess the extent and potential impact of flooding events among other hydrometeorological phenomena. شریفی، ا.، ثقفیان، ب. و اشتایناکر، ر. ه.، 1395، بررسی کارایی جدیدترین نسل محصولات بارش ماهواره‌ای با وضوح زمانی- مکانی بالا: ششمین کنفرانس ملی مدیریت منابع آب ایران، دانشگاه کردستان، کردستان، ایران. Beck, H. E., de Jeu, R. A., Schellekens, J., van Dijk, A. I., and Bruijnzeel, L. A., 2009, Improving curve number based storm runoff estimates using soil moisture proxies: IEEE Journal of Selected Topics in Applied Earth Observations and Remote Sensing, 2, 250–259. Bindlish, R., Crow, W. T., and Jackson, T. J., 2009, Potential role of passive microwave remote sensing in improving flood forecasts: IEEE Geoscience and Remote Sensing Letters, 6, 112-116. Blankenship, C., Case, J. L., and Zavodsky, B., 2015, SMOS soil moisture data assimilation in the NASA Land Information System: Impact on LSM initialization and NWP forecasts: 29th Conference on Hydorology, 95th AMS Annual Meeting, Phoenix, AZ. [Available online at https://ams.confex.com/ams/95Annual/webprogram/Manuscript/Paper263645/AMS-2015-SMOS-ext-abs.pdf]. Cenci, L., Pulvirenti, L., Boni, G., Chini, M., Matgen, P., Gabellani, S., Squicciarino, G., and Pierdicca, N., 2017, An evaluation of the potential of Sentinel 1 for improving flash flood predictions via soil moisture–data assimilation: Advances in Geosciences, 44, 89-100. Chan, S., Bindlish, R., O'Neill, P. E., Njoku, E., Jackson, T., Colliander, A., et al., 2016, Assessment of the SMAP Level 2 Passive Soil Moisture Product: IEEE Transactions on Geoscience and Remote Sensing, 54(8), 4994-5007. Crow, W. T., and Ryu, D., 2009, A new data assimilation approach for improving runoff prediction using remotely-sensed soil moisture retrievals: Hydrology and Earth System Sciences, 13(1), 1-16. Draper, D. W., Newell, D. A., Wentz, F. J., Krimchansky, S., and Skofronick-Jackson, G. M., 2015, The Global Precipitation Measurement (GPM) Microwave Imager (GMI): Instrument Overview and Early On-orbit Performance: IEEE Journal of Selected Topics in Applied Earth Observations and Remote Sensing, 8(7), 3452- 3462. Entekhabi, D., Njoku, E. G., O’Neill, P. E., Kellogg, K. H., Crow, T., Edelstein, J. K., et al., 2010, The soil moisture active and passive (SMAP) mission: Proceedings of the IEEE, 98(5), 704-716. Fleming, K., Awange, J. L., Kuhn, M., and Featherstone, W. E., 2011, Evaluating the TRMM 3B43 monthly precipitation product using gridded raingauge data over Australia: Australian Meteorological and Oceanographic Journal, 61, 171–184. Hazarika, M. K., Kafle, T. P., Sharma, R., Karki, S., Shrestha, R. M., and Samarkoon, L., 2007, Statistical approach to discharge prediction for flood forecasts using TRMM data: Proceedings of 5th Annual Mekong Flood Forum, 17-18 May, Ho Chi Minh City, Vietnam. Hu, Y. M., Ding, Y. H., and Liao, F., 2010, An improvement on summer regional climate simulation over East China: Importance of data assimilation of soil moisture: Chinese Science Bulletin, 55, 865−871. Huffman, G. J., Bolvin, D. T., Braithwaite, D., Hsu, K., Joyce, R., Kidd, C., Nelkin, E. J., and Xie, P., 2015a, NASA Global Precipitation Measurement (GPM) Integrated Multi-satellitE Retrievals for GPM (IMERG): Algorithm Theoretical Basis Document (ATBD), NASA, version 4.5, 30 pp. Huffman, G. J., Bolvin, D. T., and Nelkin, E. J., 2015b, Integrated Multisatellite Retrievals for GPM (IMERG) technical documentation. Available at: http://pmm.nasa.gov/sites/default/files/document_files/IMERG_doc.pdf (last access: 18 December 2017). Huffman, G. J., Bolvin, D. T., Nelkin, E. J., Stocker, E. F., and Tan, J., 2017a, V05 IMERG Final Run Release Notes. 9 November 2017; Rev. 13 November 2017, 17 November 2017: NASA Goddard Earth Sciences Data and Information Services Center, Greenbelt, MD, USA. [Available online at https://pmm.nasa.gov/sites/default/files/document_files/IMERG_FinalRun_V05_release_notes-rev2.pdf]. Huffman, G. J., Bolvin, D. T., Nelkin, E. J., and Stocker, E. F., 2017b, V05 IMERG Early and Late Run Release Notes. 1 December 2017:NASA Goddard Earth Sciences Data and Information Services Center, Greenbelt, MD, USA. [Available online at https://pmm.nasa.gov/sites/default/files/document_files/IMERG_EarlyLateRun_V05_release_notes.pdf]. Javanmard, S., Yatagai, A., Nodzu, M. I., BodaghJamali, J., and Kawamoto, H., 2010, Comparing high-resolution gridded precipitation data with satellite rainfall estimates of TRMM_3B42 over Iran: Advances in Geosciences, 25, 119–125. Jolliffe, I. T., and Stephenson, D. B., 2011, Forecast Verification: A Practitioner’s Guide in Atmospheric Science: John Wiley and Sons, 2nd edition, 292 pp. Kim, S., Paik, K., Johnson, F. M., and Sharma, A., 2018, Building a flood-warning framework for ungauged locations using low resolution, open-access remotely sensed surface soil moisture, precipitation, soil, and topographic information: IEEE Journal of Selected Topics in Applied Earth Observations and Remote Sensing, 11(2), 375-387. Koster, R. D., Mahanama, S. P., Livneh, B., Lettenmaier, D. P., and Reichle, R. H., 2010, Skill in stream flow forecasts derived from large-scale estimates of soil moisture and snow: Nature Geoscience, 3, 613–616. Lakshmi, V., Bindlish, R., Fayne, J., Huffman, G. J., Jackson, T. J., Kirschbaum, D., Skofronick-Jackson, G., and Yueh, S., 2016, Mapping the 2015 South Carolina flood using SMAP and GPM measurements: GEWEX News, 26(2), 6-10. Massari, C., Brocca, L., Moramarco, T., Tramblay, Y., and Lescot, J. F. D., 2014, Potential of soil moisture observations in flood modelling: Estimating initial conditions and correcting rainfall: Advances in Water Resources, 74, 44-53. Massari, C., Camici, S., Ciabatta, L., and Brocca, L., 2018, Exploiting satellite-based surface soil moisture for flood forecasting in the Mediterranean area: state update versus rainfall correction: Remote Sensing, 10(2), p.292. Moazami, S., Golian, S., Hong, Y., Sheng, C., and Kavianpour, M. R., 2016, Comprehensive evaluation of four high-resolution satellite precipitation products under diverse climate conditions in Iran: Hydrological Sciences Journal, 61(2), 420-440. Renzullo, L., Chappell, A., Raupach, T., Dyce, P., Li, M. , and Shao, Q., 2011, An assessment of statistically blended satellite-gauge precipitation data for daily rainfall analysis in Australia: Proceeding of 34th international symposium on remote sensing of environment (ISRSE), 10–15 April, Sydney, Australia. Schneider, U., Fuchs, T., Meyer-Christoffer, A., and Rudolf, B., 2008, Global precipitation analysis products of the GPCC: Global Precipitation Climatology Centre (GPCC), DWD, Internet Publication, 112pp. Sharifi, E., Steinacker, R., and Saghafian, B., 2016, Assessment of GPM-IMERG and other precipitation products against gauge data under different topographic and climatic conditions in Iran: Preliminary results: Remote Sensing, 8(2), 135. Su, F., Hong, Y., and Lettenmaier, D. P., 2008, Evaluation of TRMM Multisatellite Precipitation Analysis (TMPA) and its utility in hydrologic prediction in the La Plata Basin: Journal of Hydrometeorology, 9, 622–640. Sungmin, O., Foelsche, U., Kirchengast, G., Fuchsberger, J., Tan, J., and Petersen, W. A., 2017, Evaluation of GPM IMERG Early, Late, and Final rainfall estimates using WegenerNet gauge data in southeastern Austrai. Hydrology and Earth System Sciences, 21(12), 6559-6572. Tang, G., Ma, Y., Long, D., Zhong, L., and Hong, Y., 2016, Evaluation of GPM Day-1 IMERG and TMPA Version-7 legacy products over Mainland China at multiple spatiotemporal scales: Journal of Hydrology, 533,152-167. Wanders, N., Karssenberg, D., Roo, A. D., De Jong, S. M., and Bierkens, M. F. P., 2014, The suitability of remotely sensed soil moisture for improving operational flood forecasting: Hydrology and Earth System Sciences, 18(6), 2343-2357. Wang, Z., Zhong, R., Lai, C., and Chen, J., 2017, Evaluation of the GPM IMERG satellite-based precipitation products and the hydrological utility: Atmospheric Research, 196, 151-163. Xie, P., Chen, M., Yang, S., Yatagai, A., Hayasaka, T., Fukushima, Y., and Liu, C., 2007, A gauge-based analysis of daily precipitation over East Asia: Journal of Hydrometeorology, 8, 607–626.